Ibrahima Sambégou Diallo may have become the first African mathematician of the contemporary era to have elaborated a theorem. This Guinean journalist who recently reconverted himself into mathematics has found the solution to the Goldbach’s conjecture, which is one of the oldest best unsolved mathematics problems of all times. The Goldbach’s conjecture was elaborated 270 years ago by Christian Goldbach, tutor of the tsar Peter II, and employee in the Russian Foreign affairs’s ministry. In 1742, Goldbach sent a letter to Euler, stating the Goldbach’s conjecture: “Every even integer greater than 2 can be expressed as the sum of two primes.” For instance, 6 = 3 + 3; 8 = 3 + 5; 10 = 3 + 7 = 5 + 5; 30 = 11 + 19 = 13 + 17; 100 = 17 + 83 … This mathematical problem was so hard to solve that it took 270 years, and hundreds of mathematicians around the globe working on it. It took Ibrahima 14 years of hard work to finally come up with the answer; this projects him in the court of the great mathematicians of this world. He had been in contest with some well-known and well-supported American researchers. Ibrahima Sambégou Diallo has been knocking at all doors to validate his work. Finding no support in his own country, Guinea, Ibrahima has decided to go to Dakar to validate his results at the mathematics institute there. 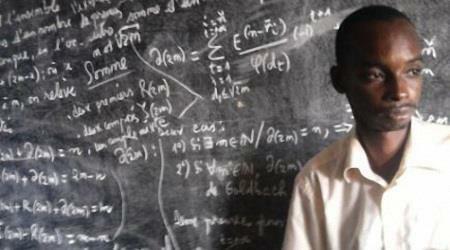 He hopes to find support so as to become the first contemporary African to have elaborated a theorem. For the full article, go to diasporas-noires.com. Thanks for visiting my blog and for the encouragements. Wonderful accomplishment, and great reporting! I will share your info with Runoko Rashidi, Cab Kabaila,, whose email addresses I will look up since they post on the African diaspora, culture and science. This info is needed to inform public school systems, especially those with Afrodescendant youngsters. Thank you Edith for visiting my blog, and for sharing with others. waw, genius brother, but where can we find his works? Well WHO Taught the europeans math anyway? just write an article and publish on arXiv (for free)…no need seeking to confirm your ideas from sources. Once it appears on arXiv, you can consider searching for someone from the field to proof-read. Is he from Ecuatorial Guinea? As a daughter of the Kongo, such a story lifted my spirits but more importantly is a reminder of where it all started. We need to hear and to be reminded of these contemporary examples of our African heritage. I simply must say…Thank you. Peace. Thank you Sister! Thank you for visiting my blog. Peace. Thanks for the comments Melisa. There are links on the post with more information. An impressive share! I’ve just forwarded this onto a friend who has been doing a little research on this. And he in fact ordered me dinner because I discovered it for him… lol. So allow me to reword this…. Thank YOU for the meal!! But yeah, thanx for spending time to talk about this issue here on your site. Proud to be African is ok. But it should be for the right reason. M. Diallo still has not provided a proof (his first announcement dates from 2011, we’re in 2015 now). He is about to be entered in the (very) long list of stupid people who have claimed to have solved the Goldbach conjecture before having the proof verified (simply posting it on a math website would have yielded results in a few weeks). By spreading the rumour of his “discovery”, unwanted attention has been attracted to Africa. M. Diallo, by publicly criticising his home country’s University for not recognising his (false) “accomplishment” has damaged the image of African science. Shame!